Enveloped on all sides by a sea of natural preserve, S.L. Rey acts as a private island of residences offering families access to the area's most highly-regarded schools w/Bonsall Elementary School nearby. 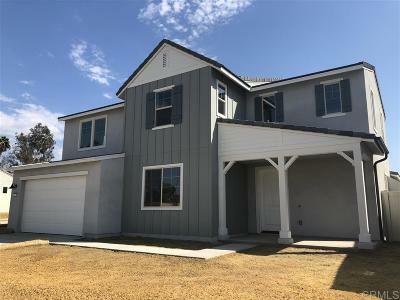 This two story home offers 3,239 sqft, 5 bedrooms 3 1/2 baths, bonus room and laundry upstairs. A 3 car garage w/storage an Outdoor California room and quartz countertops are among our highlights! Still time to pick your favorite flooring! QUICK MOVE-IN! PROPERTY TAX ONLY 1.1% NO MELLO ROOS!, S.L. Rey in Bonsall is pleased to showcase the beautiful Homesite 22, Plan 4E at entrance to a private cul-de-sac! This family friendly 5 bed, 3.5 bath residence offers a Farmhouse-Style exterior, 3 car garage & storage, 3,239 sq. ft. of living space, a bonus room, and a open floorplan design that extends into an expansive outdoor living space. This generous kitchen features Whirlpool Stainless Steel Appliances, beautiful Matte White Thermofoil Shaker cabinets with Soft Close Doors and Drawers. You will also find stunning Quartz Slabs at the oversized kitchen island and counters. Entire house painted a beautiful soft gray color! HOME INCLUDES UPGRADED FLOORING!!! *Specifications and features set above are to the best of the sellers knowledge, accurate as of the date hereof. Notwithstanding this fact, this listing is for informational purposes only and may not list all options, upgrades or decorator items. Seller reserves the right to change specification of features and upgrades included in this home, as necessary for time to time. Photos/virtual tours are of model home or renderings which are for artist conception only, not actual house. 3 CAR Garage is subject to vehicle specifications/size.